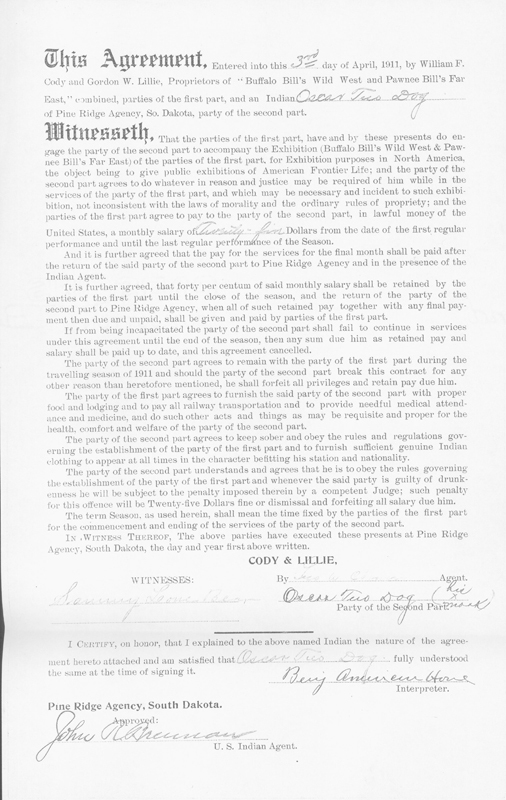 This Agreement, Entered into this 3rd day of April, 1911, by William F. Cody and Gordon W. Lillie, Proprietors of "Buffalo Bill's Wild West and Pawnee Bill's Far East," combined, paries of the first part, and an Indian Oscar Two Dog of Pine Ridge Agency, So. Dakota, party of the second part. Witnesseth, That the parties of the first part, have and by these presents do engage the party of the second part to accompany the Exhibition (Buffalo Bill's Wild West & Pawnee Bill's Far East) of the parties of the first part, for Exhibition purposes in North America, the object being to give public exhibitions of American Frontier Life; and the party of the second part agrees to do whatever in reason and justice may be required of him while in the services of the party of the first part, and which may be necessary and incident to such exhibition, not inconsistent with the laws of morality and the ordinary rules of propriety; and the parties of the first part agree to pay to the party of the second part, in lawful money of the United States, a monthly salary of twenty-five Dollars from the date of the first regular performance and until the last regular performance of the Season. And it is further agreed that the pay for the services for the final month shall be paid after the return of the said party of the second part to Pine Ridge Agency and in the presence of the Indian Agent. 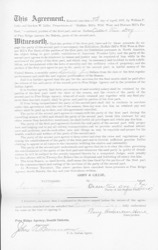 It is further agreed, that forty per centum of said monthly salary shall be retained by the parties of the first part until the close of the season, and the return of the party of the second part to Pine Ridge Agency, when all of such retained pay together with any final payment then due and unpaid, shall be given and paid by parties of the first part. If from being incapacitated the party of the second part shall fail to continue in services under this agreement until the end of the season, then any sum due him as retained pay and salary shall be paid up to date, and this agreement cancelled. The part of the second part agrees to remain with the party of the first part during the travelling season of 1911 and should the party of the second part break this contract for any other reason than heretofore mentioned, he shall forfeit all privileges and retain pay due him. The party of the first part agrees to furnish the said party of the second part with proper food and lodging and to pay all railway transportation and to provide needful medical attendance and medicine, and do such other acts and things as may be requisite and proper for the health, comfort and welfare of the party of the second part. The party of the second part agrees to keep sober and obey the rules and regulations governing the establishment of the party of the first part and to furnish sufficient genuine Indian clothing to appear at all times in the character befitting his station and nationality. The party of the second part understands and agrees that he is to obey the rules governing the establishment of the party of the first part and whenever the said party is guilty of drunkenness he will be subject to the penalty imposed therein by a competent Judge; such penalty for this offence will be Twenty-five Dollars fine or dismissal and forfeiting all salary due him. The term Season, as used herein, shall mean the time fixed by the parties of the first part for the commencement and ending of the services of the party of the second part. In Witness Thereof, The above parties have executed these presents at Pine Ridge Agency, South Dakota, the day and year first above written. Party of the second part. I certify, on honor, that I explained to the above named Indian the nature of the agreement hereto attached and am satisified that Oscar Two Dog fully understood the same at the time of signing it. John R Brennan U. S. Indian Agent.